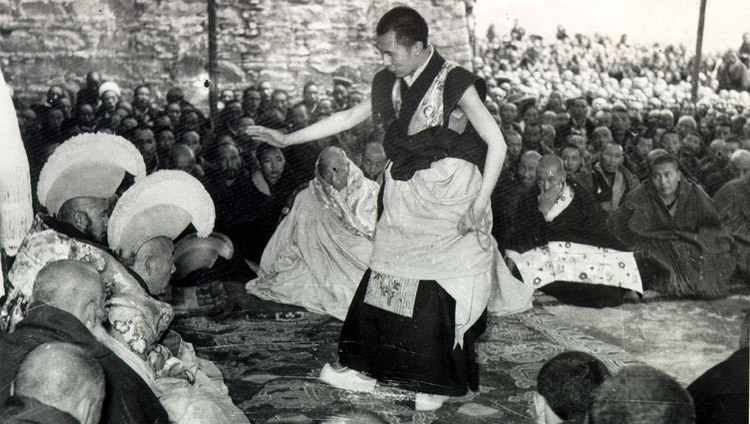 In 1950, after China’s invasion of Tibet, His Holiness was called upon to assume full political power. 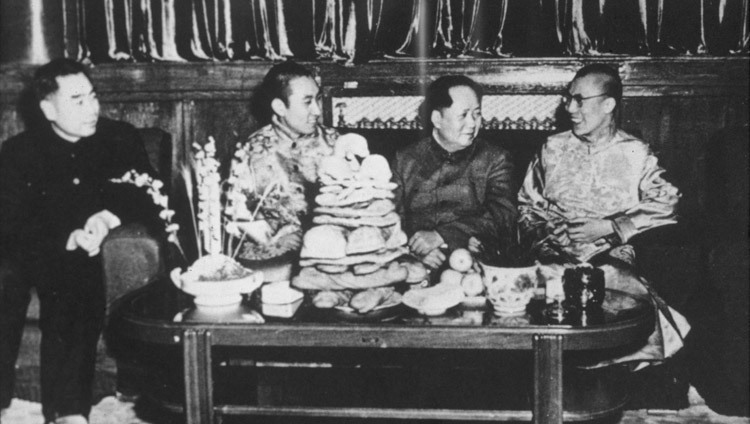 In 1954, he went to Beijing and met with Mao Zedong and other Chinese leaders, including Deng Xiaoping and Chou Enlai. Finally, in 1959, following the brutal suppression of the Tibetan national uprising in Lhasa by Chinese troops, His Holiness was forced to escape into exile. Since then he has been living in Dharamsala, northern India. In 1963, His Holiness presented a draft democratic constitution for Tibet , followed by a number of reforms to democratise the Tibetan administration. The new democratic constitution was named “The Charter of Tibetans in Exile”. The charter enshrines freedom of speech, belief, assembly and movement. It also provides detailed guidelines on the functioning of the Tibetan Administration with respect to Tibetans living in exile. In May 1990, as a result of His Holiness’s reforms the Tibetan administration in exile was fully democratized. The Tibetan Cabinet (Kashag), which until then had been appointed by His Holiness, was dissolved along with the Tenth Assembly of the Tibetan People’s Deputies (the Tibetan parliament in exile). In the same year, exiled Tibetans living in India and more than 33 other countries elected 46 members to an expanded Eleventh Tibetan Assembly on a one-person one-vote basis. That Assembly then elected the members of a new cabinet. In September 2001, in a further step towards democratization the Tibetan electorate directly elected the Kalon Tripa, the Chairman of the Cabinet. The Kalon Tripa appointed his own cabinet who then had to be approved by the Tibetan Assembly. This was the first time in Tibet’s long history, that the people had elected their political leaders. Since the direct election of the Kalon Tripa, the custom by which the Dalai Lamas, through the institution of the Ganden Phodrang, have held temporal as well as spiritual authority in Tibet, has come to an end. Since 2011, when he devolved his political authority to the elected leadership, His Holiness has described himself as retired. 1 Transformation of the whole of Tibet into a zone of peace. 2 Abandonment of China’s population transfer policy that threatens the very existence of the Tibetans as a people. 3 Respect for the Tibetan people’s fundamental human rights and democratic freedoms. 4 Restoration and protection of Tibet’s natural environment and the abandonment of China’s use of Tibet for the production of nuclear weapons and dumping of nuclear waste. 5 Commencement of earnest negotiations on the future status of Tibet and of relations between the Tibetan and Chinese peoples. 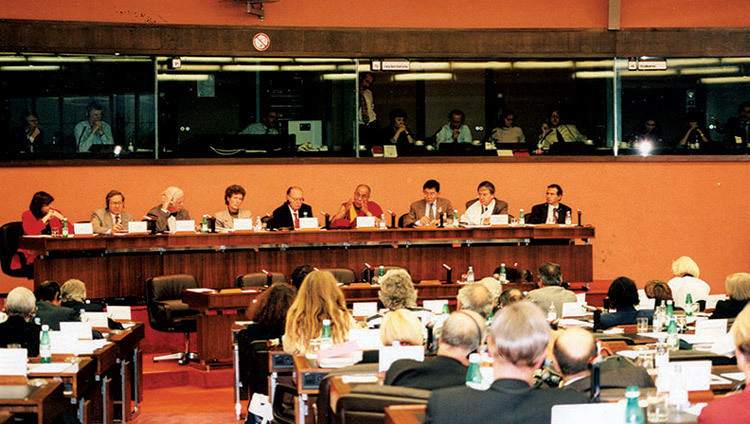 On 15 June 1988, in an address to members of the European Parliament in Strasbourg, His Holiness further elaborated on the last point of the Five-Point Peace Plan. He proposed talks between the Chinese and Tibetans leading to a self-governing democratic political entity for all three provinces of Tibet. This entity would be in association with the People’s Republic of China and the Chinese Government would continue to be responsible for Tibet’s foreign policy and defence. Since the mid-1980s, His Holiness has engaged in a dialogue with modern scientists, mainly in the fields of psychology, neurobiology, quantum physics and cosmology. This has led to a historic collaboration between Buddhist monks and world-renowned scientists in trying to help individuals achieve peace of mind. It has also resulted in the addition of modern science to the traditional curriculum of Tibetan monastic institutions re-established in exile. On 14 March 2011 His Holiness wrote to the Assembly of Tibetan People’s Deputies (Tibetan Parliament-in-exile) requesting it to relieve him of his temporal authority, since according to the Charter of the Tibetans in Exile, he was technically still the head of state. He announced that he was ending the custom by which the Dalai Lamas had wielded spiritual and political authority in Tibet. He intended, he made clear, to resume the status of the first four Dalai Lamas in concerning himself only with spiritual affairs. He confirmed that the democratically elected leadership would assume complete formal responsibility for Tibetan political affairs. The formal office and household of the Dalai Lamas, the Gaden Phodrang, would henceforth only fulfill that function. as a human being, His Holiness is committed to the promotion of human values such as compassion, forgiveness, tolerance, contentment and self-discipline. He says that as human beings we are all the same. We all want happiness and do not want suffering. Even people who do not believe in religion can benefit if they incorporate these human values into their lives. His Holiness refers to such human values as secular ethics or universal values. He is committed to talking about the importance of such values and sharing them with everyone he meets. as a religious practitioner, His Holiness is committed to the promotion of religious harmony and understanding among the world’s major religious traditions. Despite philosophical differences between them, all major world religions have the same potential to create good human beings. It is therefore important for all religious traditions to respect one another and recognize the value of their respective traditions. The idea that there is one truth and one religion is relevant to the individual practitioner. However, with regard to the wider community, we need to recognise that there are several truths and several religions. 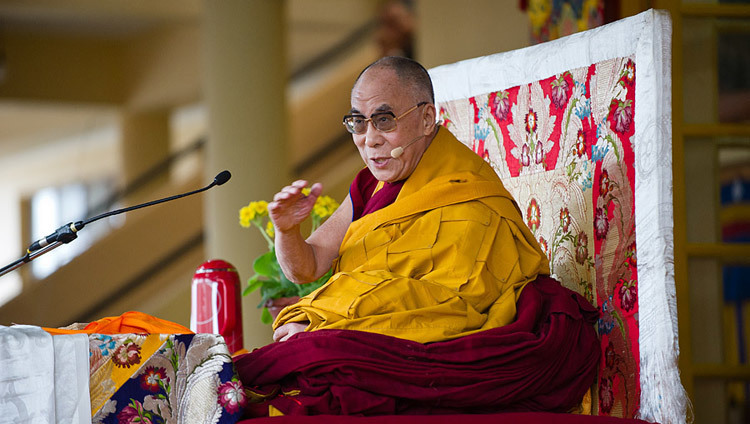 His Holiness is a Tibetan and as the ‘Dalai Lama’ is the focus of the Tibetan people’s hope and trust. Therefore, his third commitment is to work to preserve Tibet’s Buddhist culture, which is a culture of peace and non-violence and protect the natural environment of Tibet.